Nate Diaz has always been known for weird ideas. Last night, he claimed he is headlining UFC 230. But he also stated he will be fighting for a title in a new weight class – 165 lbs. According to Nate Diaz, it is called “superfighter devision”. Dana White almost instantly denied the reports. Brett Okamoto wrote he talked to Dana White on the phone. The UFC president is not friendly towards that idea. But as well as you can see, Nate Diaz sticks to his story. I reached Nate Diaz (@NateDiaz209) via text. Dustin Poirier has already been asking for UFC 165-pound title shot. He supported Nate Diaz. UFC Welterweight and Lightweight division contain the highest number of fighters. So Nate Diaz’s statement might actually make sense. Generally, 165 lbs are not far from the weight of an average man who is 175-180 cm tall. Many Lightweight and Heavyweight competitors are within that range. Of course, there are few big guys, like Darren Till! Kevin Lee was also calling for this weight class earlier. Yet, the potential 165-pound winner would probably have right to call the winner of Khabib Nurmagomedov Vs Conor McGregor. If that happens to be The Notorious, he would get a chance to fight for a title shot in the third different weight class. Now take a good look at Ariel Helwani’s status. 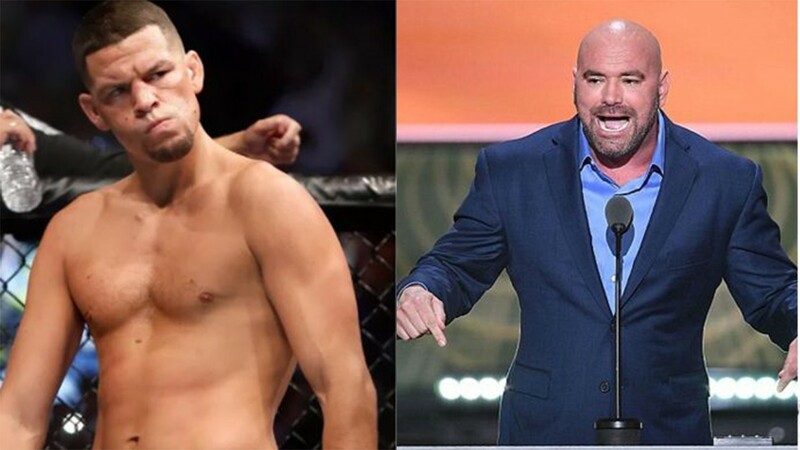 UFC thinks about adding one more Interim title to the Madison Square Garden fight card? Many fighters supported Nate’s idea. Take a look at their Twitter comments. Would you like to see a new weight, division? Fans of Conor McGregor are probably thrilled by the idea. The Notorious might become the only man who won UFC title in three different weight classes if 165-pound weight class is approved! Do you support Nate Diaz? Do you think one more Interim title shot is simply too much? Next articleFighters rush to show support for new 165 lb division, so why won’t the UFC create it?